Every year, a big two-day celebration (moulid) with a procession in honour of Abu el-Haggag takes place in Luxor, but who was this man? That's what is said: Yusuf Abu el-Haggag was a Sufi Sheikh from Damascus (or Baghdad - there are conflicting sources). In 1221, he arrived on his way back from Mekka in Luxor and decided to stay. However, it was not not as simple as it sounds. At that time, Luxor was Coptic, and was ruled by a Coptic Lady called "the Princess". Her soldiers suspected Abu el-Haggag to be a spy and took him to the Princess for questioning. He complained to her about the treatment he received and expressed that he wishes to become a local citizen. The lady was generous and allowed him to stay. Thereupon, he asked her to give him a piece of land as big as a camel’s skin to sleep on it. Assuming that it would have a maximum of 2 square meters, she agreed and confirmed the deal by contract. At night, he took a camel’s skin, cut it into a very thin line before some local witnesses, and bordered a big part of the Luxor Temple with it. Firstly, the lady felt deceived but after several meetings with Abu el-Haggag, she was impressed by his knowledge and finally, she converted to Islam. At the time, there was a church in the place of the mosque. Abu El-Haggag agreed with the princess to convert the building into a mosque - today's Abu el-Haggag Mosque inside the Luxor Temple. 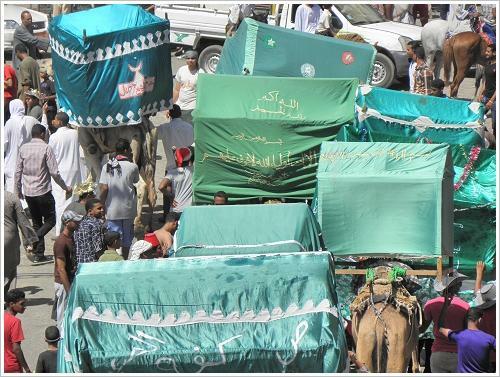 The popular sheikh founded a sufi order and was said to have the power to practice miracles. 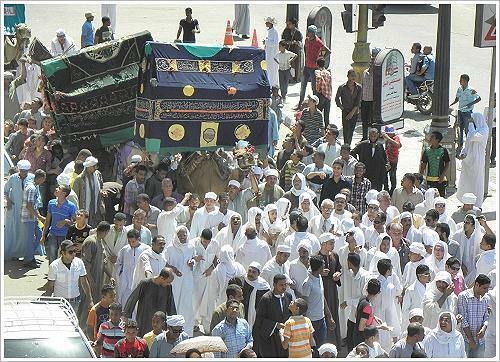 When he died he was buried below the mosque. 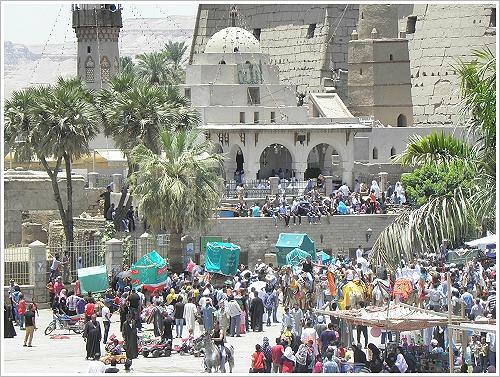 However, the festival also originates in the ancient Egyptian opet festival. 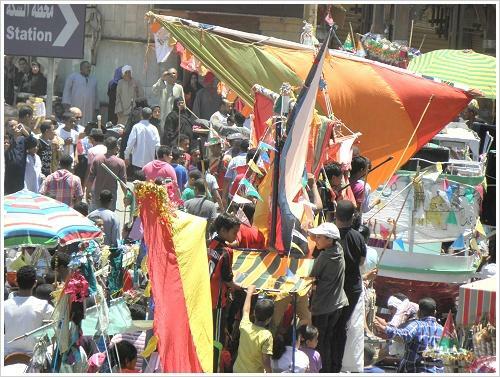 The big boats which are nowadays pulled on the 2nd day of the festival in a procession through the streets of Luxor should remind of the sacred barques for the statues of the gods of Amun, Khonsu and Mut which were escorted in a joyous procession from the temple of Amun in Karnak to the temple of Luxor in order to relive their marriage and celebrate their rebirth. 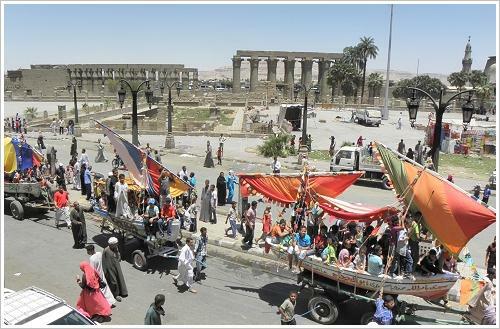 In ancient times, the festival served to renew ma'at, the ideal cosmic and social order: "Be happy, whole country! The good time has come." 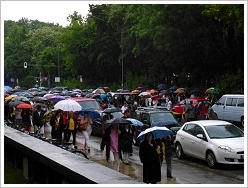 Recently, the patient burden bearers, which are omnipresent in Egyot, came to fame: From 9 to 16 May 2013 the 5th "Caravan Festival of the Arts" took place. This year's motto was "In Peace and with Compassion. The Way Forward". 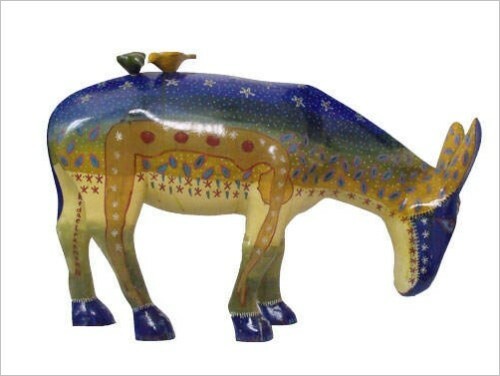 32 Egyptian and 13 western visual artists designed 90 fiberglass donkeys. Why donkeys? Because they symbolise peace in both Islam and Christianity, found in both the Bible and in the Qur’an - and the Caravan Festival uses the Arts as a bridge for inter-religious and intercultural dialogue. 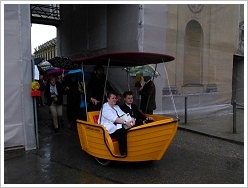 It was sponsored by the Embassy of Switzerland in Egypt, and supported by the British Council. Another artist who participated was Alaa Awad. He graduated from Luxor’s Faculty of Fine Arts and currently teaches in its department of mural painting. He is famous for his gorgeous pharaonic murals ( Portrait of Alaa Awad on our German website). 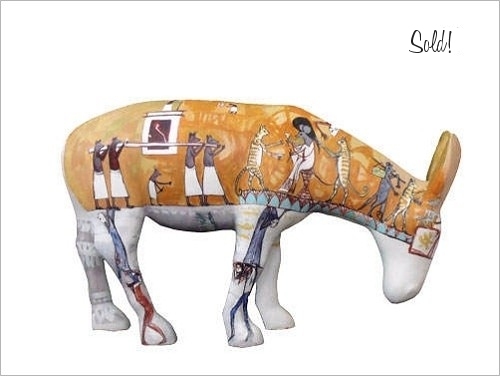 His donkey wants to highlights the story of Egyptian artisans who worked on the tombs in the Valley of the Kings for the pharaohs in the ancient village of Deir el-Medina. 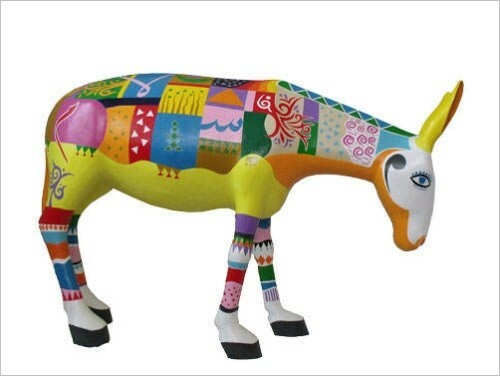 After the festival’s opening ceremonies, where all painted and decorated donkeys had been on display, each of the donkeys had been installed for a two-week period in strategic locations throughout Cairo, such as hotel lobbies, art galleries, cultural centers and educational institutions. 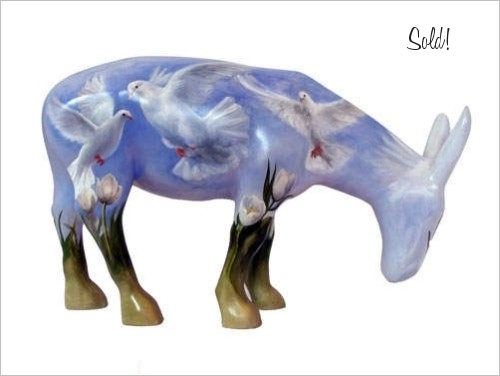 Now, 25 donkeys will be exhibited in Geneva and London before being auctioned off for charity in London. 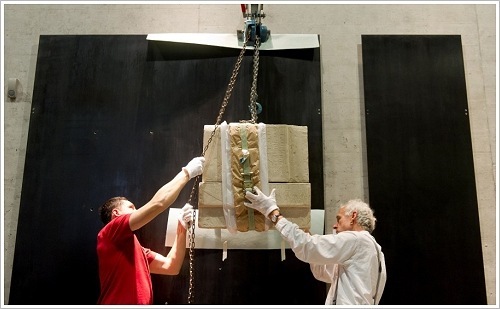 On Sunday, 9 June 2013 at 5 pm the State Museum of Egyptian Art closed its doors in Munich's Residence and moved the last artifact - a 20 cm high statue of King Amenemhat III - in a procession to its new home. The new site in the center of Munich’s art district celebrates ancient Egyptian art as an integral element of international art through the ages. The unique museum, which is the only one outside of Egypt that is dedicated solely to ancient Egyptian artifacts., is now housed in a state-of-the-art building, fulfilling the highest standards of technology and function in museum architecture. The permanent exhibition rejects chronological constraints in favour of orientation by theme. With some 1.800m², the new site offers around three times as much space as the collection’s old location – as well as a room for special exhibitions. Visitors will now enter the Egyptian Museum through a lowered entrance door, leading to its underground exhibition rooms welcomed by God Horus. Daylight flows into this space through an atrium cut into the lawns above. A perfect lighting set ensures that every single piece comes into its own. The pictures of Amenemhat III below on its former and actual location show which difference the right lighting makes. 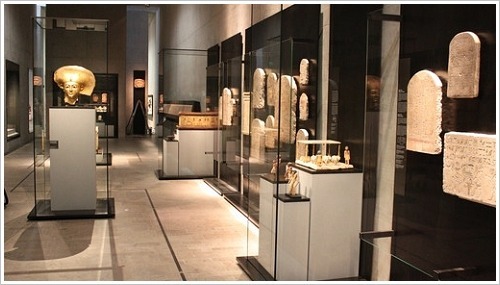 The museum displays 2.000 exhibits out of more than 8.000 including many from Luxor/Thebes. Interactive multimedia modules and mobile guides (tablets) explain more than 120 pieces. Remarkable: For ethic reasons no mummies are presented, just their sarcophagi - great! 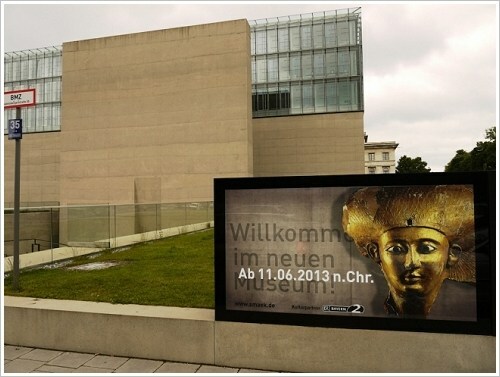 So - if you can't go to Egypt this year visit the Egyptian Museum in Munich. Actually, only cats are said to have nine lives. However, when one reads the press reports of the last week he could think the same of Zahi Hawass. Since 2002, the prominent and US graduated egyptologist with his Indiana Jones outfit was Secretary General of the Egyptian Supreme Council of Antiquities (SCA). From 31-01-2011 to 06-03-2011 and again from 30-03-2011 to 17-07-2011 he was appointed minister of the newly created Ministery of State for Antiquities Affairs. Hawass is regarded as one of the most important and powerful egyptologists of today. Even so, one of the most dreaded, too, because he offensively insists on the return of many irregularly taken Ancient Egyptian artifacts, such as the Rosetta Stone, the bust of Nefertiti, or the Dendera zodiac. During his time in office he planned 14 new museums including the Grand Egyptian Museum at Giza. After the topple of Hosni Mubarak Zahi Hawass was also under fire from all sides. Colleagues brought dozens of charges against him, the prosecutor general banned him from traveling outside Egypt. Then for a while nothing was heard about and from him. It was just put about that he would pursue private studies. The travel ban had been lifted, the charges dropped. Since early in June Hawass is back on international tour. In September 2013, you can join a Live Web-Conference with him and in February 2014 a 14-day itinerary through Egypt with visits to many sites that are normally closed or limited to the public. But it's not just that. Obviously, Zahi Hawass, which considers himself an apolitical man, reflects over an official comeback. With growing concern he sees that ancient Egyptian sites crumble, are looted and overbuilt. Even these colleagues, which belong not to his declared followers, must admit that no one before or after him had cared for the protection of Egypt's antiquities in such an effective and enthustiastic way. With his unmatched charisma, he knew to promote the Egyptian heritage abroad and thus to raise funds for its much needed conservation. In 1997, when after the assassination at the Hatshepsut Temple the tourism plummets, he succeeded like no one else to regain the trust in Egypt as a safe tourist country. And so he said in all his singular modesty in the LiveScience interview: "I think, I'm the only one who can really bring the tourists back to Egypt." On Sunday, 9 June 2013, the Scientific Committee of the Centre Franco-Égyptien d’Étude des Temples de Karnak (CFEETK) announced the official launch of the Karnak Project - The Global Index Project for Karnak Temples Inscriptions. 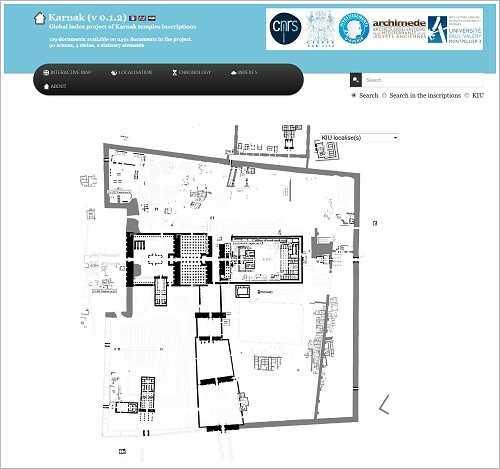 It aims to organize and make available textual documentation from the temples of Karnak. The database includes photographs and facsimiles, typographical editions of the inscriptions, transliterations and translations as well as archival materials. It can be searched for all conceivable criteria.